The Cuisinart SM-55 stand mixer, housed in durable die-cast metal, features a powerful 800-watt motor that can handle the heaviest mixing tasks. The unit provides 12 mixing speeds, along with a 15-minute countdown timer and automatic shutoff, for maximum precision. The mixer's tilt-back head allows for easy access to the mixing bowl and makes attaching accessories simple. The SM-55 features slow-start function to eliminate splatter and the ultra-gentle fold function to carefully blend in delicate ingredients. Its large, 5-1/2-quart, stainless-steel bowl accommodates big batches, even double recipes. The Cuisinart 5.5 Quart Stand Mixer White has many exciting features for users of all types. 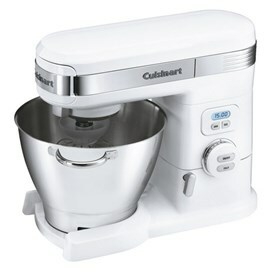 See the Cuisinart 5.5 Quart Stand Mixer White gallery images above for more product views. The Cuisinart 5.5 Quart Stand Mixer White is sold as a Brand New Unopened Item.